The rugged coastline of Knapdale with views of Islay and Jura. On Monday morning I woke up to a fresh blue sky – the perfect day for a two-wheeled trip someplace new. 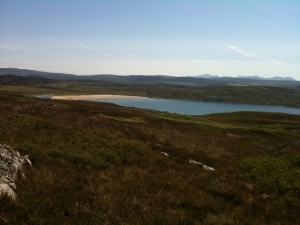 And where better than Kintyre, the mysterious mass of land across the loch. I caught the ferry from Portavadie to Tarbert, stocked up on snacks from the co-op, and set off along the single-track road that winds its way along the western coast of Knapdale. After climbing up through shady woodland, I emerged into dazzling sunshine. The road stretched ahead of me, shimmering in the heat. Beyond the rolling, rough farmland and dark patches of pine forest, there was a splash of blue loch. White butterflies passed like pieces of tissue paper caught on the breeze. Foamy meadowsweet, thistles and harebells filled the verges, and honeysuckle draped in the trees. I raced on, listening to the bleat of sheep and wondering if my rattling bike chain was anything to worry about. Further on a streak of yellow caught my eye and I pulled up by a gate. There, beyond a grassy field dotted with clover and freshly shorn sheep, was a wide, empty beach. It would have been a perfect place to stop for lunch and a dip, but for the sign on the gate that said: ‘BULL ON SHORE’. I dithered, and like a big chicken decided not to take the chance and pedalled on. 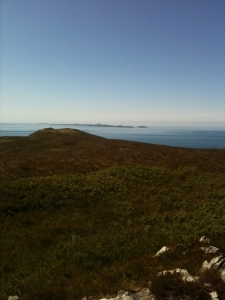 As I rounded the next headland, Jura and Islay came into view. They seemed to float, other worldly, in a sea of misty blue. It was as if I were looking down on a mountain range, the islands the peaks poking up through the clouds. A beetle landed on my hand, turned a few circles like a dodgem and then flew on its way. I too went on my way, hurtling along the road next to the sea with the smell of salty, sun-dried seaweed ripe in the air. 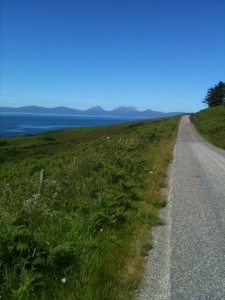 The view of Jura just minutes before my bike broke.